Happy Monday! Hope everyone had a great weekend. We actually stayed in Enid this weekend, for the first time in a few weeks, and surprisingly we were quite busy. I was expecting to catch up on a lot of housework, cooking and blogging, but only a little of each happened! We did manage to discover an awesome hidden gem, The BBQ Joint, a little BBQ shack in the middle of nowhere. I know I often refer to things in Oklahoma as being in the middle of nowhere, but it’s usually an exaggeration. Not so much in this case. In the 10 miles surrounding this place, there are maybe a couple farms and a junkyard. It was about half an hour from Enid, but SO worth the drive. Best ribs I’ve had in my whole entire life. Please come visit me, and I will take you! We also managed to get in some yard sale-ing (yes, I’m 50), checked out the pool on base (it’s been brutally hot here, forecasted high of 104 tomorrow), and went bowling! I can’t remember the last time I went bowling (Jillian’s, most likely), but I was happy to discover that Nick is just as bad at it as I am. Before the weekend got too crazy, I did manage to get a homecooked meal in. Again, I went to my trusty binder and found an old Rachel Ray recipe I’d cut out from her magazine. 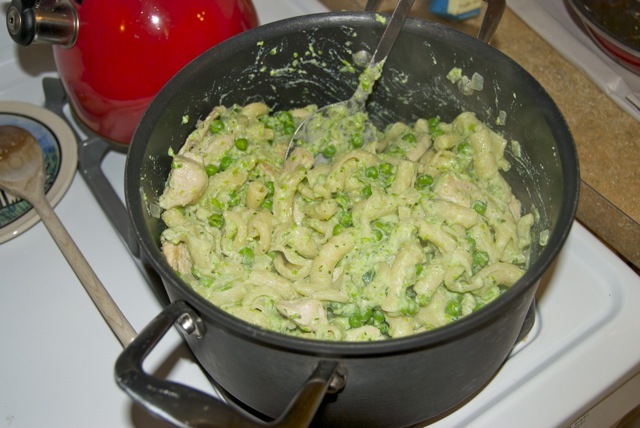 The recipe was originally vegetarian, but I added some chicken for the meatatarian. Heat a pan over medium heat and add 1 tbsp olive oil. 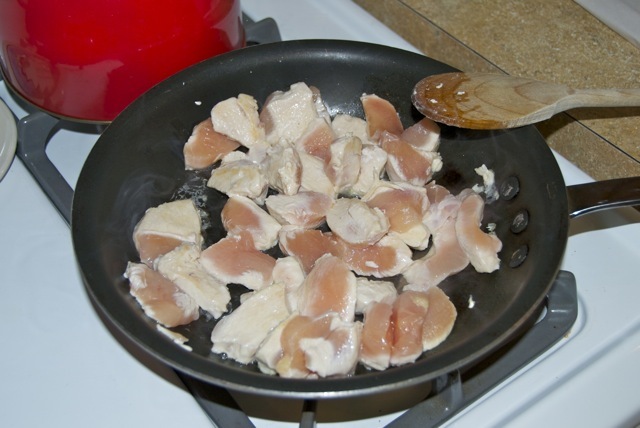 Cook the chicken in the pan until browned and just cooked through. Set aside. 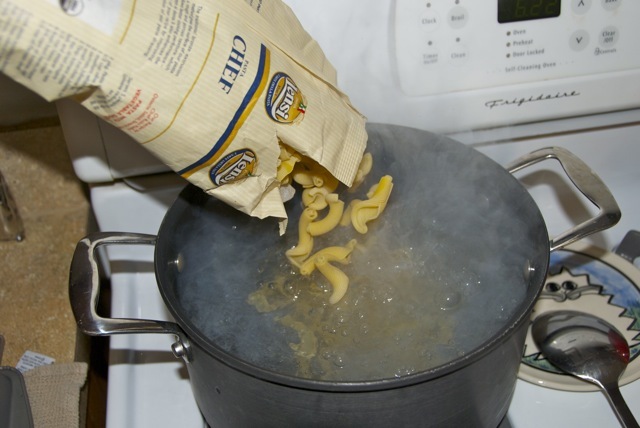 Bring a large pot of water to boil, cook the pasta until al dente, and drain, reserving 1 cup of pasta cooking water. 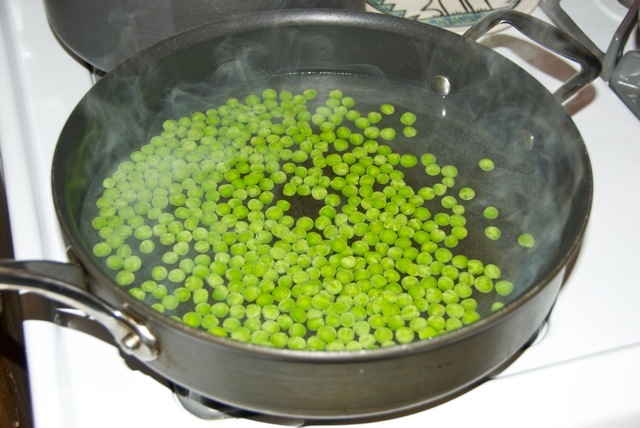 Meanwhile, bring another pot of water to boil (I used the saute pan I’d be using next, since I already had 35 dishes to wash and didn’t want to add another), add one of the boxes of peas and cook 2 minutes. Drain. 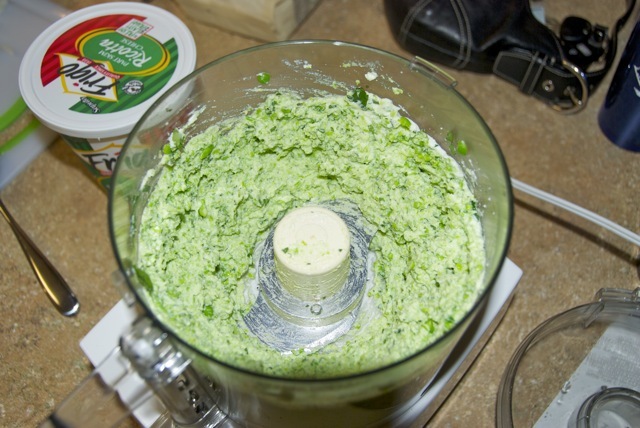 In a food processor, combine hot peas, ricotta, mint, and parsley. Season with salt & pepper. Heat remaining olive oil in a saute pan over medium heat. Add the onions and cook about 5 minutes until slightly soft. Add the chicken stock and bring to a simmer. 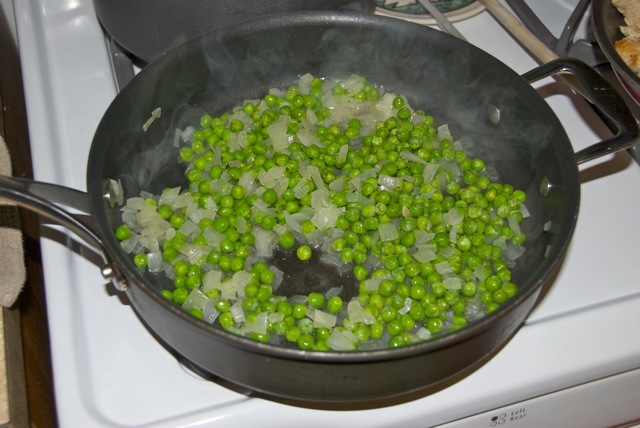 Add the second box of peas and cook until heated through. Season with salt and pepper. 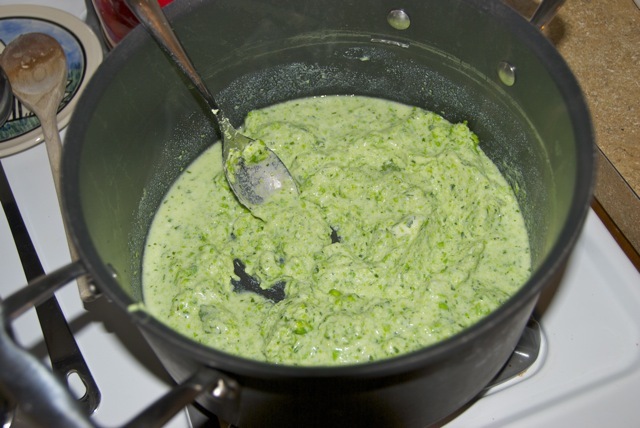 Transfer the ricotta mix to a large bowl or empty pasta pot. 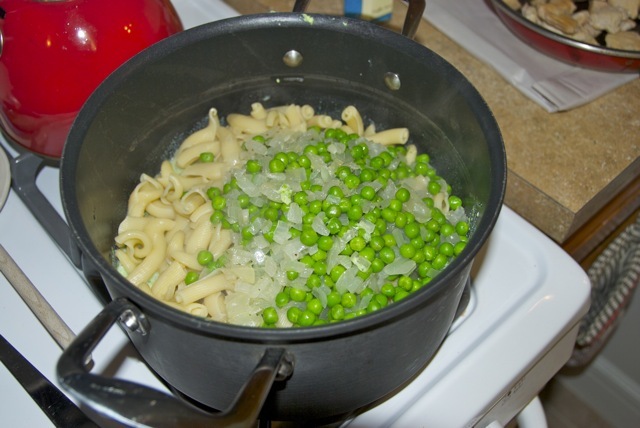 Add the reserved pasta water and mix. Add the pasta, chicken, and onion mix. Toss everything together. Season again with salt and pepper. 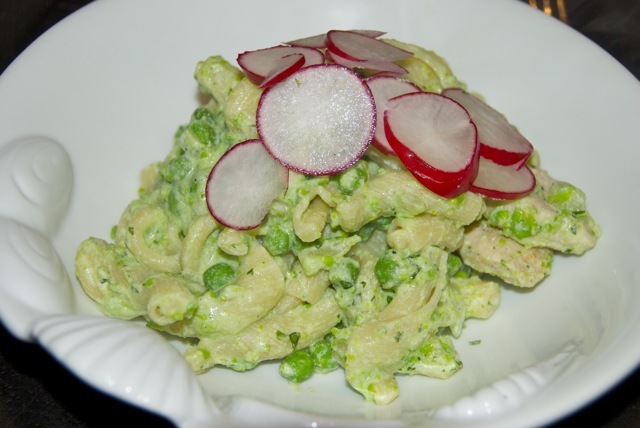 Serve topped with sliced radishes. 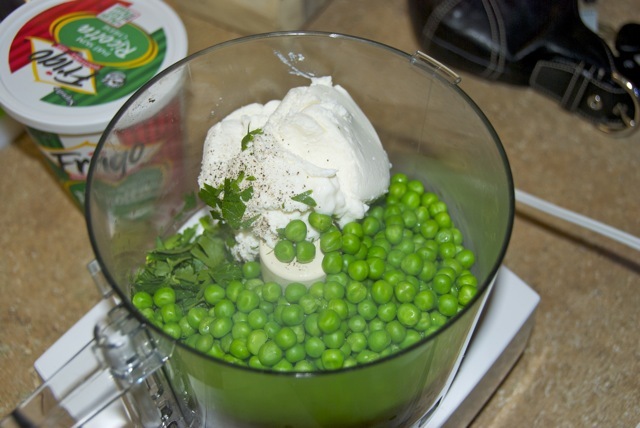 When I first saw this recipe, I thought the radishes were totally random and weird. But they work really well! 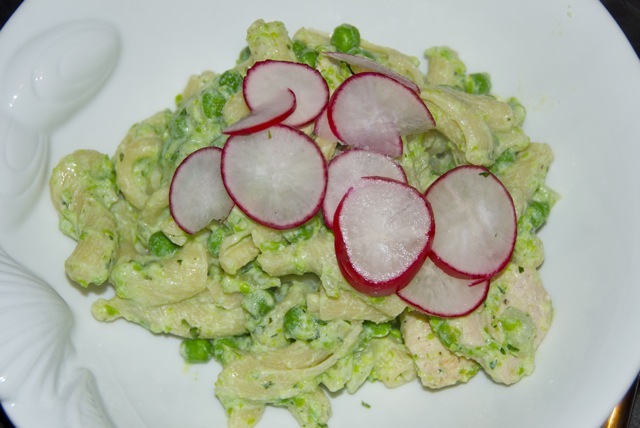 The crunchiness adds nice texture to the pasta and the slight pepperyness went well with the sweet peas. Nick’s not a huge pasta fan (blasphemy! ), so this wasn’t his favorite dish. I didn’t expect it to be– every once in a while I have to make something for myself! I did notice that the leftovers disappeared, though, so it couldn’t have been that bad!